This is a backup site – please click on this link to go to Lafafa Catering’s official site for all wedding, festival and private catering enquiries. We can provide delicious Middle Eastern food for all your events. We are experienced wedding caterers and we are happy to plan a menu with you to cater for all tastes and dietary requirements (and locations). Lindsay and Annie of Lafafa catering are an absolute joy to deal with. From the first few emails it was clear that Lafafa would be perfect. They helped us choose a selection of dishes, and we came away from a delicious tasting session with absolute confidence that our wedding breakfast would be fantastic. Lindsay met us at the venue in advance of the reception to discuss logistics and she offered loads of helpful suggestions to make the day run smoothly and to maximise our budget. The meal that Lafafa prepared for us and our 80 guests was exceptional. Lafafa catering is based in the South West and covers Cornwall, Devon, Somerset and surrounding area. Once you have looked around the website to see what we have to offer on the menu pages please contact us so we can talk you through the range of possibilities and you can book our catering services. We offer wedding tastings. For feedback from past clients click on testimonial in categories. We also cater out of our trailer at festivals and events in the South West serving our delicious signature falafel filled pittas and mezze plates. For a more alternative wedding we can bring the trailer with us. Call us for more information or contact us using the form provided. Alternatively email us at lafafacatering@googlemail.com or call us on m:07530 070417 or t:01736 762755. Our food is contemporary Middle Eastern: fresh, visually exciting, delicious and perfect for weddings, dinner parties and most types of events. We can provide a mezze large or small and great for sharing. 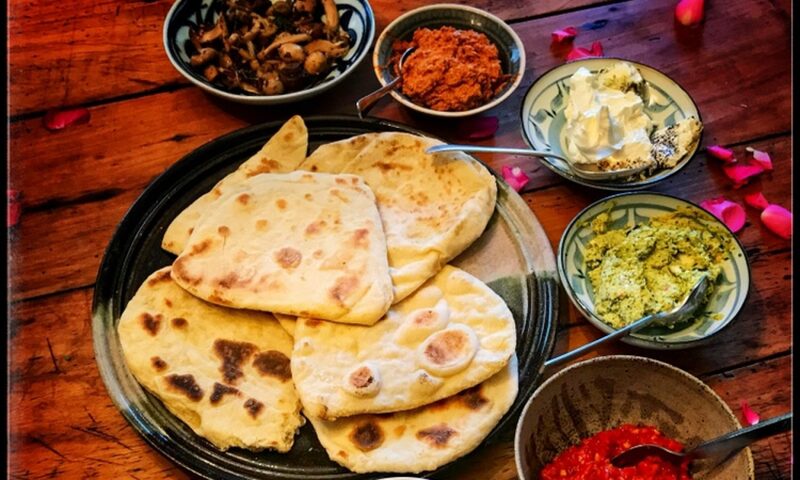 Choose a selection of dips and flatbread from purees and dips. Choose a meat dish or two from meat and fish and then to finish head to salads and vegetarian. Should have mentioned canapes you can start with. We can provide buffets for larger events and plated food for dinner parties and smaller events. We also offer a range of big pan dishes, cooked on site. That only leaves desserts to finish off your meal. We know how important your wedding day is and we know you want to get everything perfect so we will work closely with you to get all the details right. We offer wedding tastings to help you decide if we are the right caterer for you. Once you have decided on Lafafa Catering we get you to fill in an online form so we have all the information we need for your wedding day. It may seem like a long form but it is all the detail that makes your day just how you want it.